The Madagascar Dragon Tree, or Dracaena marginata, is an evergreen tree that is known for having a great deal of character. As its name suggests, this species is native to Madagascar and grows in tropical and subtropical areas. Madagascar Dragon Tree care is relatively easy, so they are great for beginner gardeners. They make a great addition to homes, offices, hotel lobbies, and many other indoor areas. Other common names for this plant include Red Edge Dracaena, Dragon Blood Tree, Red Margined Dracaena, Ribbon Plant, and Tree Dracaena. Height 2.5-4 meters outdoors. 1.5-2.5 meters indoors. Light Bright light. Protect from direct hot sunshine. Water Regular watering to maintain moist soil. Reduce watering in winter. Toxicity Mildly toxic to cats and dogs. Madagascar Dragon Trees are recognizable by their slender stalks and spiky leaves, which give them a modern, contemporary look. Due to the shape of their leaves and their bare woody stems, some think that these plants resemble palm trees but in reality, they are actually closely related to lilies. In terms of size, these plants grow to be about 6 to 8 feet indoors and approximately 15 to 20 feet outdoors. They are fairly slow growing and can live for many years when cared for correctly. A Madagascar Dragon Tree should not be placed in direct sunlight where it can become very hot, as this will burn its leaves. These plants should also not be placed in a dark corner with no sunlight. They do best with medium to bright light with partial shade, but these plants will survive in low light as well. Low light, however, will slow down the plant’s growth and result in new leaves that are smaller and thinner than average. Make sure to give your Madagascar Dragon Tree a quarter turn every week or so to expose the different sides of the plant to the different lights in the room. Since Madagascar Dragon Trees are used to rainfall from their natural tropical environments, the salts and fluorides in our water can lead to brown tips on their leaves. You should therefore ideally water these plants with filtered or non-fluoridated water. Watering should only be done when the soil is dry, to prevent overwatering the plant. This is typically needed once every two to three weeks in the warmer months of the year. As for the wintertime, reduce watering to once per month or even once every 6 to 8 weeks. The leaves will provide a good indication of whether or not the plant is receiving too much or too little water. Brown, dry leaf tips are often a sign of underwatering. Soft, brown or yellow leaves, and waterlogged soil indicate overwatering. What Soil Do Madagascar Dragon Trees Need? No special soil is required for Madagascar Dragon Trees, but it is important to use a well-draining or fast-draining soil to prevent the roots from rotting. In addition, the pot should have drainage holes or rocks at the bottom so that the water doesn’t pool. Root rot will typically occur as a result of overwatered potting soil or slow-draining soil mix. During the plant’s growing season, which is from the spring to the summer, keep the soil uniformly moist at all times. The soil should never dry to more than one third of the depth of the pot but should also never be too wet. Madagascar Dragon Trees are slow-growing plants and do not need or want much fertilizer. If you do choose to fertilize, be sure to use liquid fertilizer and only do it a few times per year during the growing season, which is the spring and the summer. Do not fertilize these plants in the fall or the winter and always use a weak fertilizer, one that is no more than 50 percent strength. Basic household humidity is fine for this plant, but it won’t hurt to give your Madagascar Dragon Tree a regular misting to add a bit of extra humidity. Optimal conditions are between 40 and 55 percent humidity, but these plants are relatively adaptable to all different levels of humidity. If you live in a climate with harsh winters, the leaves may begin to brown at their tips due to low humidity and if this happens, a humidifier may be necessary. Madagascar Dragon Trees can tolerate a wide range of indoor temperatures but cannot tolerate freezing. Ideal temperatures fall between 65 and 80 °F. These plants are sensitive to temperature changes, especially cool drafts, so they should never be placed on chilly windowsills or close to cold glass. If grown in low temperatures for extended periods of time, white or yellow spots may form on the plants. In the springtime, tiny white flowers may bloom and in the summertime, yellow-orange berries may follow. The white flowers supply a nice fragrance and the berries add a beautiful touch of color. Flowering, however, is not a main feature of this plant and is uncommon, especially for indoor plants. Should your Madagascar Dragon Tree flower, take it as a nice surprise. The Madagascar Dragon Tree doesn’t need a whole lot of pruning. If there are large brown tips or any yellow leaves, you can trim these tips or simply pull off the leaves. 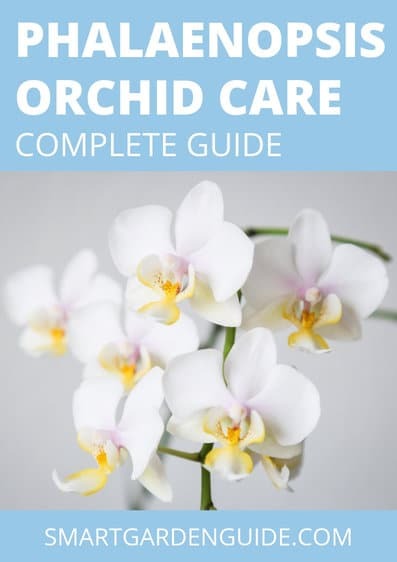 If the heads get droopy, which usually occurs due to lack of light or inconsistent watering, you can cut the heads off and new ones will sprout out. This is a neat feature of the Madagascar Dragon Tree because it allows you to play around with the plant’s appearance and control how it grows. With pruning, you can twist the stalks together to create a braided form, or you can even train these plants to grow in spirals and various other formations. By pruning the side shoots, you can manage the vertical growth and encourage the plant to branch out horizontally. Madagascar Dragon Trees can be propagated from stem cuttings and it is fairly easy to do so. To propagate this plant, cut off a portion of the stem from a mature plant and after allowing the cuttings to dry, plant them in wet soil. The cut portions should be about 4 to 6 inches in length. In about 1 to 3 weeks, the cuttings will begin rooting and soon enough, you will have a family of Madagascar Dragon Trees. Rooting hormone is not necessary. Compared to many other houseplants, Madagascar Dragon Trees are relatively easy to care for. That said, there are some tips and tricks that will keep your plant happy and healthy to ensure the best results. For one, since this species is used to the tropical climate in Madagascar, mimic these conditions by placing your pot on a bed of wet pebbles to increase humidity. Another tip is to spray your plant or wipe the leaves every so often to get dust off the plant if it has been kept indoors for a long period of time. While Madagascar Dragon Trees can be re-potted, you should not be in a rush to do so because this plant thrives when it is root-bound in smaller pots. Should you decide to transplant this species, the best time to do it is in the early spring, just before the growing season. To aid the plant in this transition, be sure to mist both the leaves and the trunk thoroughly after re-potting. The benefits of re-potting include making more room for future root growth and replenishing the soil with a fresh potting soil mix. Some varieties of the Dracaena marginata include the Dracaena marginata Tricolor, the Dracaena marginata Colorama, the Dracaena marginata Tarzan, and the Dracaena marginata Magenta. 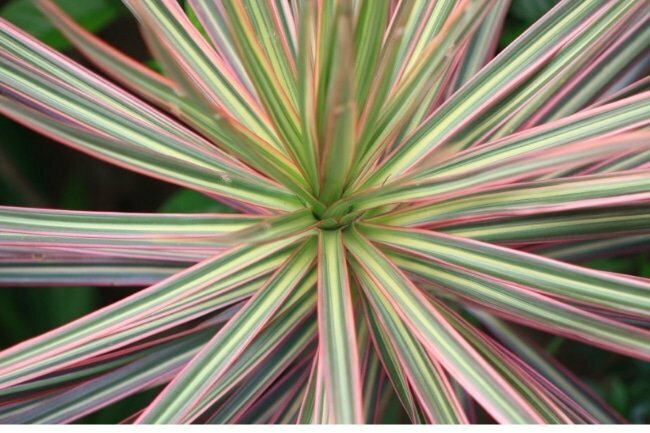 As the name Dracaena marginata Tricolor suggests, this variety has three colors on its leaves instead of two – red, green, and yellow – and includes a yellow band in between the standard red edge and green leaf. 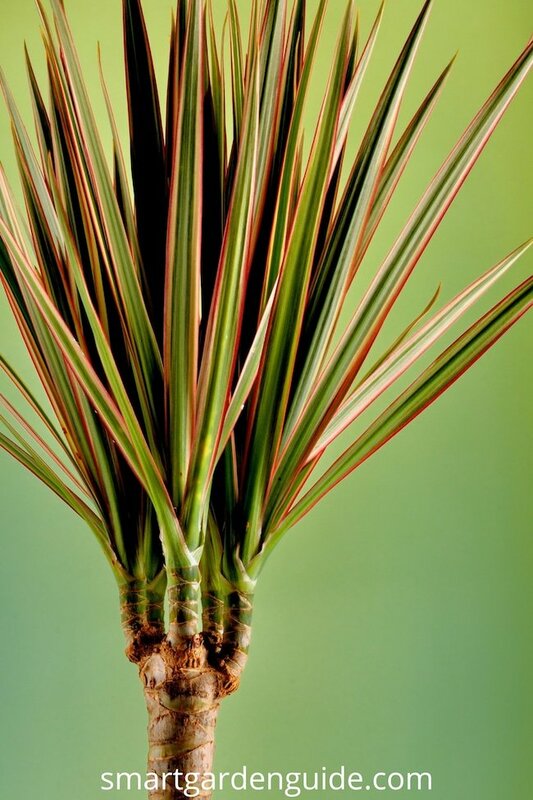 The Dracaena marginata Colorama is unique in that it features colors that are much more vibrant than the other varieties and it also grows at a slower rate. The Dracaena marginata Tarzan has wider, longer, and spikier leaves than the standard kind and boasts dark purple margins. 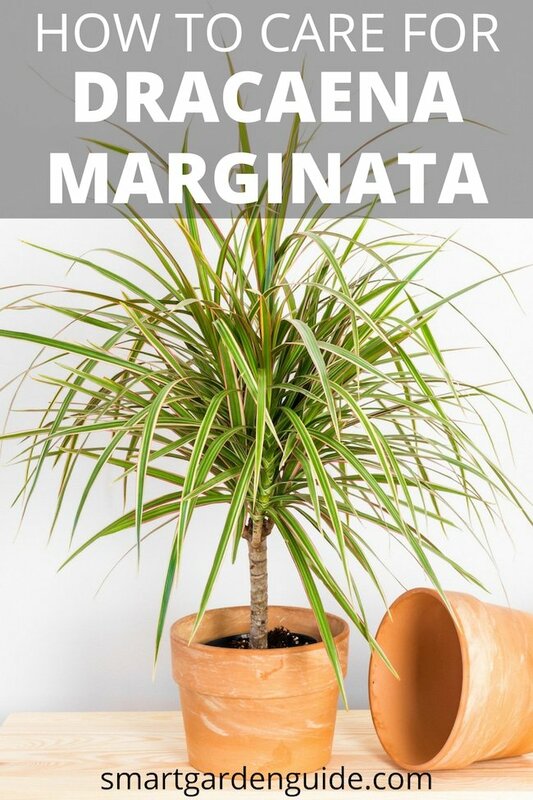 Lastly, the Dracaena marginata Magenta is named after its magenta or burgundy foliage and has a slightly softer look to it compared to other types. While diseases are fortunately rare for this plant, pests are a bigger problem and must be treated immediately. The two main diseases to look out for are foliage fungal disease and root rot, both of which are often a result of the plant being kept too wet. Root rot typically occurs in the winter, so it is important to take extra caution when watering during the colder months of the year. As for pests, Madagascar Dragon Trees are especially susceptible to spider mites, as well as mealybugs and scales. There are a number of ways to control these, such as a homemade spray or simply picking the insects off. A soapy spray is good for spider mites while an alcohol spray is good for mealy bugs. Alternatively, a horticultural oil spray will do the job. Scales usually result in brown spots on the plant which can be picked off if not too extensive. You can also take the plant to the sink or the shower, or even outside in the rain, and give it a good spray or wash. If you do so, be sure to get the underside of the leaves because that is where the critters live and breed. While the Madagascar Dragon Tree is not poisonous to humans, it is toxic to dogs and cats and should therefore not be introduced to a household with pets. Should your pet be exposed to or ingest any species of the Dracaena genus, common symptoms include vomiting, lack of appetite, excessive production of saliva, and dilated pupils. Other possible things to look out for are drooling, diarrhea, abdominal pain, weakness, and poor coordination. Why Is My Madagascar Dragon Tree Losing Its Leaves? A sudden loss of leaves is typically not a good sign and it is very important that you identify the cause quickly in order to save your plant. A Madagascar Dragon Tree may lose its leaves for a number of reasons including temperature changes, cool drafts, inconsistent watering, improper drainage, and pests. Once you identify the cause, be sure to make the appropriate changes immediately to give your plant the greatest chance of survival. If your Madagascar Dragon Tree is only losing its lower leaves, this is actually quite common and is not a cause for concern since these plants tend to shed their lower leaves as they age. What Should I Do If The Leaves Of My Madagascar Dragon Tree Are Brown Or Yellow? Browning or yellowing of the leaves is almost always a sign that your Madagascar Dragon Tree is receiving too much or too little water, respectively. First, check to see if the soil is wet or dry and act accordingly. Yellow leaves can also indicate root rot. If you believe that the soil is perfectly fine, check for pests – the most common are spider mites, mealybugs, and scales. If you brought your plant home relatively recently or moved it from one location in your home to another, discolored leaves may be a result of the change in environment. Wait to see if your plant bounces back, it could be in a bit of shock due to the new location and may just need some time to adjust. 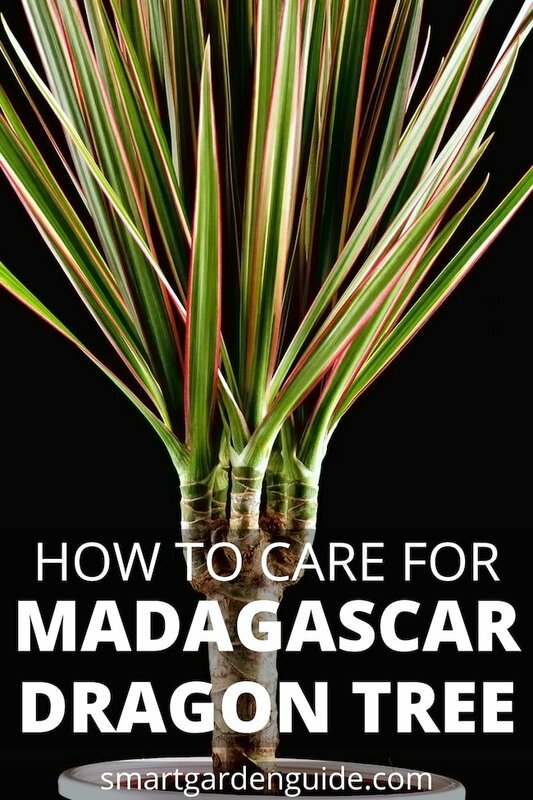 I hope you enjoyed this article about Madagascar Dragon Tree Care. It really is a fantastic choice of houseplant, that will be a great addition to any home. Feel free to check out my other houseplant articles here.